New as a vacation rental, Hinoki House is a residence designed and built by master craftsman Thamby Kumaran, his mentor Ichikawa Kihei, and Michael Singer. Traditional post-and-beam Japanese craftsmanship is combined with classic California design sensibilities to create light-filled rooms and a strong sense of form and materiality. This unique property sits on a wild meadow, bounded on two sides by cypress hedgerows and within reach of the Pacific Ocean. Whether you are looking for quiet relaxation or a bit of outdoor adventure, the property and location offers both. From your front door stroll less than 1/2 mile to Point Cabrillo State Park that includes the historic 1909 Light Station (30.5 acres), approximately 270 acres of undeveloped coastal bluffs, prairie, and numerous coves, including Frolic Cove, the site of the shipwreck Frolic. Also within a 1/2 mile walk enjoy Caspar Beach which offers rental of paddle boards, surfboards or kayaks. Hinoki House's peaceful setting is the perfect retreat from the hustle of modern life. 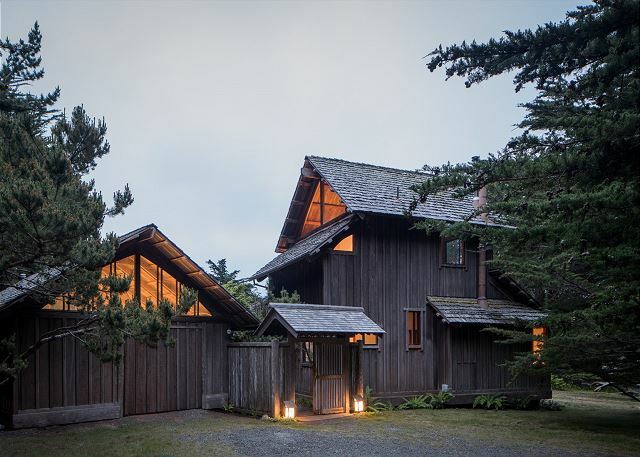 With its old world craftsman architecture, zen shoji screens, and natural setting it is truly a tranquil escape. We loved staying at the Hinoki House. Loved the Japanese style and simplicity.. It had mist everything we needed and it was great to be able to bring our dog. We loved this house, an architectural delight when it comes to Japanese building structures. The setting is perfect in its natural surroundings. One drawback: the lower level bedroom lacks a closet and offers no clothes hooks, that issue needs to be addressed. We loved our time at the HInoki House. It's a unique, handcrafted ,Japanese style, peaceful and comfortable getaway. We loved that it is centrally located to all the fun exploring to do on the Mendocino coast. The beds are comfortable and the secret meadow is enchanting. There is even a coffee table book there showing and telling the story of the building of the house. We spent four great days, over the Thanksgiving Holiday at the Hinoki House. We were four adults and one dog. The house is a comfortable size with plenty of windows. The surrounding trees provide ample privacy. Each day we we had the wild turkeys and deer wander through the yard. There are many roads you can take for a walk, but it is a bit of an up and down. Our only disappointment is there is no access to a washer/dryer. Kitchen was comfortable and well appointed for cookware and utensils. Overall we give the Hinoki House our highest rating. 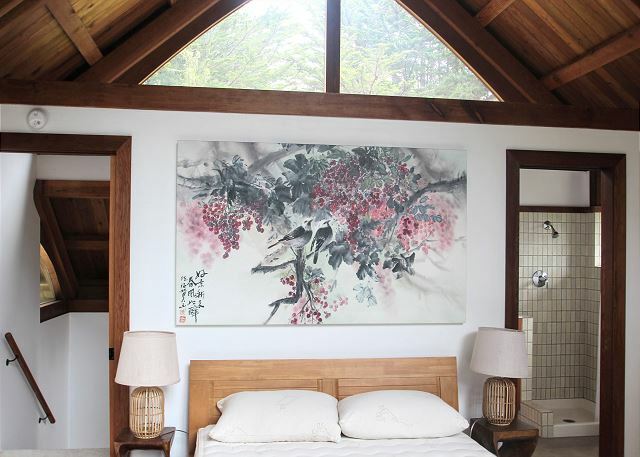 The Hinoki House was a fun and enjoyable place to simply relax and enjoy the Mendocino area. The house was spacious and very well appointed. Each of the two bedrooms (one downstairs and on upstairs) each had their own bathrooms and generous closet spaces. Both also has stand alone fireplaces, already stocked with wood for burning. Kitchen was well equipped, although with just minimal but well received appointments. All the kitchen appliances, including the range, oven, dishwasher, etc, appear new or barely used. Large personal yard, quite neighborhood and very peaceful and serene. Hinoki house is lovely. We found it not only a place to stay while enjoying the coast, but a lovely experience in itself. It was comfortable and calming. We enjoyed our morning coffee while watching deer, wild turkeys, and sometimes a wild hare run through the back meadow. We would definitely go back.